Rantings from Across the Street | A little of this…a little of that…you know how it goes! A little of this…a little of that…you know how it goes! When we purchased our new house a few months ago, we knew we had a berry bush of some descript. I was willing to bet money that we were gifted with a raspberry bush. I’ll be honest, I’m partial to raspberries…not really sure why…but I am. Maybe my insistence on mislabeling the bush outside as raspberry was just wishful thinking. Apparently wishful thinking doesn’t get you much. Yesterday, an acquaintance of mine on Facebook posted about the raspberries that she had in her yard and how tasty they were. Raspberries! Her post reminded me of our bush out back that was full of nice berries just beginning to turn red. If she had raspberries, then I should too, right? We’re in the same state after all. Down the stairs I bounded and out to the back yard to inspect my, then, raspberry bushes. Upon investigation, there were indeed some very nicely red berries on the bush. My experience with raspberries and blackberries told me that the berries aren’t ripe unless they easily pull off the vine. Sooo…I was a little surprised when the bright red berry didn’t let go, that is until I scanned the entire bush and noticed some black berries too. Ah ha! A blackberry bush – shows you how much I know about my berries. 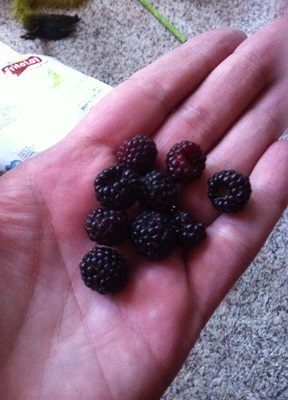 After giving the bushes a thorough once-over, I picked a small handful of blackberries from our bush. There were just enough for each of us to sample what’s to come in the next week or so. After tasting the berries, which were a nice mix of sweet and tart – in case you were wondering (you know you were) – we are now all eagerly anticipating the crop to come. My hope is that we will have enough berries off of these bushes to not only eat as they are, but to make them into a cobbler or a small batch of jam. That may be wishful thinking on my part, but that’s my goal. Canning is a new hobby of mine and one I’d like to delve a little deeper into this summer – but that’s a topic for another post. My question to you is – What are your favorite blackberry recipes? I’d love to hear about them and hopefully try a few assuming our crop allows. Cable and Satellite TV companies have it made, especially now that UHF and VHF channels are no longer available. If you want to watch local television channels, you now need a special digital antennae, converter box, or – you guessed it – cable or satellite. If you’re not a technologically savvy person, the digital antennae or converter box may intimidate you, but don’t let it. It’s really not that hard to set up, and if you’re disillusioned with your cable/satellite provider it will be worth it to you (in most cases) to get one. When we moved into our new home a few months ago, we opted to go with cable – satellite wasn’t an option for us because we’re surrounded by very mature trees…lots of them! We were excited about all of the options our cable provider afforded us, along with the free month of HBO (who doesn’t want to watch Game of Thrones?). However, our issues with cable began almost immediately. At first the DVR didn’t work, so we called a service person to replace the box. Then we started getting fuzzy images every now and then, so we’d have to reboot the boxes. Then we realized all we were really watching on cable were the old season reruns, and the shows we enjoyed watching (for the most part), were on basic television anyway. We were spending over $120 a month on cable to have faulty equipment and the ability to watch reruns. Uh….No, thank you! A couple of weeks ago I was perusing my Facebook feed and a friend of mine asked about streaming media players because she wanted to ditch her cable. My ears (eyes?) perked up at the thought of a way ditch cable too. Several of the people that commented brought up the Roku. Roku is a streaming media player that allows you to play channels or “apps” (think Netflix, Amazon Prime, Hulu, etc.) on your television set. I decided to do some more research on the Roku to see if it would fit the needs of my family as well. Turns out the Roku was just what we were looking for. The player has a slew of channels, some are subscription channels – Netflix, Pandora, Amazon, etc., and other channels are free. The cost of the Roku ranges anywhere from $50ish to $100 depending on the type box you need. This is a onetime price – no monthly fee comes with the unit. However, you MUST have an internet connection in order to use the Roku, so there is still an ongoing cost to utilize it. But if you have personal computers at home, you would be paying that fee anyway. The other fees associated with the use of the Roku are the fees for the channels that you want (not all have a fee associated with them though). Some of the channels, like Netflix and Pandora are maintained through those companies websites, others are channels that Roku provides through their service. I will say now, that you do have to put in a method of payment when you sign up with Roku – they will accept a credit card or you can use your PayPal account, which is what I did (no point in having my credit card information floating around out there more than it needs to be). This information is kept on file in case you want to add a channel to your Roku box that has a fee associated with it (in most cases the channel feel is minimal ($1.99 give or take a $1). This isn’t any different than if you were subscribing to Netflix or Hulu. We picked up a Roku XS, which is right in the middle as far as models go. 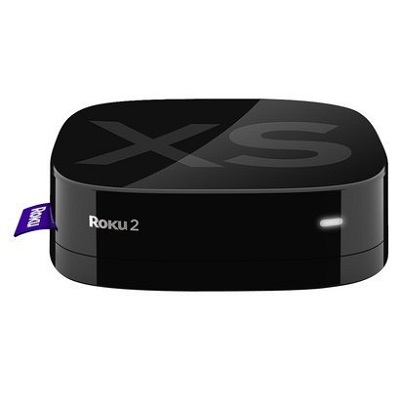 They don’t sell the XS model on the Roku Website, but we picked ours up at Walmart, and I have also seen them on Amazon.com. We officially ‘cut the cord’ this week with our Cable provider after a 2 week test run with the Roku. While there have been a few issues, overall we have really enjoyed our Roku and are planning on getting another one for the television in the bedroom. The kids, in fact, prefer the Roku options over the standard Cable options as far as television shows go. And my husband and I are enjoying the Roku because instead of the same old reruns of Law & Order or How I Met Your Mother, we can watch things that are much more interesting. As for the drawbacks -there are a few. The first one doesn’t have anything to do with the Roku itself, but with our local channels. Because we are in such a heavily wooded area we don’t always get a clear reception when trying to watch our local channels. Some stations come in better than others. That’s not such a huge issue for us because we only care about the news most days, and that is easily viewed on one of the other channels that we do get clearly. The other issue we have is with our internet speed. We will probably need to upgrade to the next higher speed of internet (we have the most basic package) because on rare occasions we have issues with buffering, but it’s not frequent enough for us to run right out and upgrade our internet. Other than those two items, the switch from cable to Roku has been very smooth. My recommendation is to give Roku a try. I wouldn’t drop your cable until you’ve tried the unit for a few weeks to make sure it’s right for you (I’m sure it won’t be the perfect choice for everyone), but for less than $100, and for the chance at saving hundreds if not thousands of dollars in cable/satellite bills, it’s worth a shot. I think you may be pleasantly surprised. When we first looked at this house, in the kitchen there was a nook…cubby…cut-out? I don’t know what you call it, but there was this space cut into the wall between the studs. There were shelves within the space and the shelves were about 6” deep. The kitchen is pretty small and lacks cabinet space, but I couldn’t for the life of me figure out what this space was used for. It’s rather long, so its use wasn’t strictly as a spice cabinet – what was its purpose? The cabinet, at the time we purchased the home, had no doors on it – just an open shelving unit. Maybe it was for knick-knacks? Much to my delight, we discovered ‘kitchy’ robin-egg blue doors in the garage that fit perfectly over this space. Not only did the doors conceal it’s awkwardness, but its great at keeping little fingers out of the goods within. Not to mention, it’s a wonderful talking point because of it’s color. Here’s what the space looks like now, and I have to say, I LOVE IT! 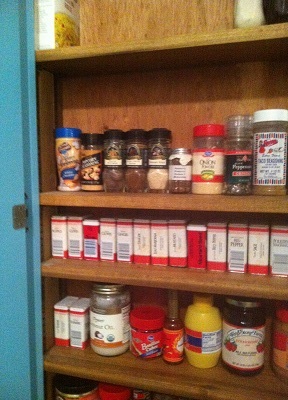 We have everything in this cabinet from spices to salad dressing to PB & J. I can put stuff for the kiddos on the bottom shelves, and the more fragile items (jars of spaghetti sauce, etc.) higher up out of the reach of little hands. It’s really been a fantastic space, and helps to free up precious cabinet storage for the larger items in our larder. If you’ve got a small living space (or just a small kitchen, like I do), I highly suggest giving this idea some thought. It’s simply a cut out between 2 studs that has been lined with wood and had some shelves added to it. You could make it as big or as small as you need – cabinet doors are optional. I think you’re going to love it. If you give it a try, or if you have a space like this in your home, I’d love to see pictures! Oh, and if you have any ideas on how to make the most of your small kitchen, let me know. We could use all the help we can get! If you’ve been following along, you know that almost two weeks ago my husband and I closed on a new house. While the house is in decent condition, it still needs some updating and repair work, and we’ve slowly but surely been making progress on our to-do list. As is the case with home ownership, you often feel like you’re sinking more and more money into the house every time you blink. Our house isn’t any different. Thankfully, out of everything we’ve had to take care of, we only had one minor blip in the radar screen (click here to see more about our adventures in gas appliances). I’m really pleased with the progress we’ve been making. Three of the rooms have been repainted (more rooms to come in the near future), new light fixtures have been installed, we’ve cleaned and cleaned, and yesterday we replaced the nasty, faded and spotted carpet in the great room. I’m REALLY excited about the new carpet. I’ve replaced windows in every home I’ve owned, but I’ve never had brand new flooring. Check out the before and after photos! The light fixture in the dining area is courtesy of my fabulous dad; the great paint job, courtesy of my mom. Couldn’t ask for more awesome parents! Before picture. Ugly brown carpet and no fixture. New carpet and light fixture. 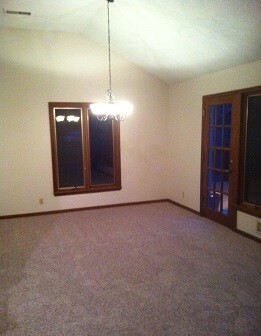 Now that the flooring is in we can start moving in the big stuff – beds, dressers, buffet, etc. The kids will be (hopefully) at their grandparents house this weekend, so we can surprise them with new bedroom makeovers when they get back. We’ve been moving the little stuff (boxes, toys, books, and more) every day – a little bit here and there will make a big difference come moving day this Saturday –Thank you God for beautiful Spring weather this weekend! Once everything is moved, then the real work begins – trying to figure out where everything is going to go. Our house is lacking in major storage areas for big things like the Christmas tree, or the nice day bed that we don’t have room for but aren’t ready to give up yet. We’re looking forward to those challenges though… I feel a blog post on creative storage spaces coming up soon! Our new home has a furnace and hot water heater run by a propane tank at the bottom of a pretty significant hill. Unfortunately, the previous owners of the house essentially let the tank run dry. According to the fella we begged to come and fill our tank this week, the lady who owned our house previously called them about a month ago and only put enough gas in the tank to ‘get by’ until the house sold. Mystery of all mysteries, the tank runs out of gas the day AFTER we buy it. Really?!?! Talk about frustrating. This wouldn’t have been a huge issue except for the fact that it’s been snowing this week…at the end of March…the beginning of Spring…hello Mother Nature… Anyway, it’s been below freezing the past several nights, so the house has been pretty darn cold. Again, this wouldn’t have been a huge issue except that when the fella from the gas company came by to fill the tank, there was an issue with lighting the pilot lights on the appliances. Originally, we thought the issue was with the fact that the tank is sitting at the bottom of a hill a significant distance from the house. After about 30 min. of trying to move the gas up the hill to the appliances, our gas guy went to the regulator and bled the line from there. No problem. Wrong! After bleeding the line, he still couldn’t get any gas to the furnace or the water heater. He worked on it and worked on it to no avail. After about 2 hours of trying to get gas to the appliances, he deems the issue NOT their problem, and suggested that I call someone to come and repair the line. The assumption was water had gotten in the line and frozen. I asked who I should call, to which I received “I don’t know.” Umm…again, Really?!?! Thank heaven for my dad and his infinite knowledge of everything! I’m not sure who I would have called for a gas line issue. Certainly wouldn’t have thought to call a plumber. I called several people of varying knowledge levels around propane gas lines. We finally settled on the guy who installed the furnace (thank God he left his contact information on the outside of the furnace). Two and a half hours later, Bob (the furnace guy) came by and checked out the line and tried to start the furnace and water heater. No luck there either. He tells us that we need to call the propane company back again. Grrr…come on guys, someone just fix it already! By this time it was 8:30 p.m. and there was no way we would be able to get someone out to the house in the dark and cold and wet to work on the gas line at that time of night. My husband opted to turn the water off and drain the pipes so nothing would freeze (by this time, we were out of heat for 2 below-freezing nights and counting). The next morning, my fabulous hubby called the gas company again and requested someone come out to the house. While he had to go hang out in a cold house for several hours before someone came by, a repair person did finally show up. He again checked the regulator and determined that the issue was not with their part of the gas line. However, this man took pity on us and continued his investigation finally determining that there was indeed water in the line somewhere between the regulator and the appliances in the house – technically the plumbers problem. BUT, instead of telling us to yet again call a plumber to correct the issue, this wonderful person took it upon himself to help us out. He blew out the line, and we now have … wait for it…hot water AND heat. Yay!! Anyway, all this was to say PLEASE, if you’ve been called to help someone out, please make a little extra effort to try to remedy what you can. In this situation, there was no reason to have had to go back to the gas company again, when they could have resolved the problem to begin with. Today was utility day. Before you move, you have to call all the utility companies and have the gas, electric, water, etc. all moved into your name (always good to do this at least 2 days before closing day, if not more). Historically, moving utilities has been a simple task – call the utility company, tell them you want the bill switched over and Voila! Instant resources! Now, post 9-11 (I’m assuming, anyway), you have to provide your blood type, DNA sample, and an agreement to give your first-born up before you can switch anything over. While all of the companies I called were more than helpful, this gal was just a tad frustrated. Credit checks were run, deposits put into place, and emergency contacts given, we now have everything but Water ready for us when we close on Friday. Tomorrow, I have to run to the water company and drop off my application for water, a deposit, AND a fee just for them to set up a new account for me. I don’t recall ever having to fill out an application in order to get my water turned on in the past?? Is this normal? Next step – call the trash, cable/internet, and phone company so we can cover the disposal and entertainment side of things. Aside from the utilities, my lovely husband and I visited a flooring company during our lunch break today to see what the possibility of getting replacement flooring for the great room would be. I was hoping and praying for a nice hardwood floor, but it looks like carpet is going to win out at 1/2 the price of new hardwood flooring…oh well. 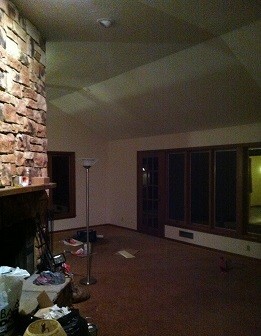 We’re looking forward to new carpet though, this will be the first house we’ve put new flooring into. We’ve replaced windows in both houses (and I’m sure this house will be the same), but never flooring. If you’re in the market for new floors, and you’re in the Louisville area, I highly recommend Bluegrass Floorcovering. They are a locally owned company, and they are great, no pressure people. We’re looking to buy carpet that’s currently in stock, so we’re saving a few pennies, but they seem to be very reasonably priced if you have to order flooring as well. This Friday, my husband and I are buying our 3rd house. We’re pretty excited about it, but who wouldn’t be? 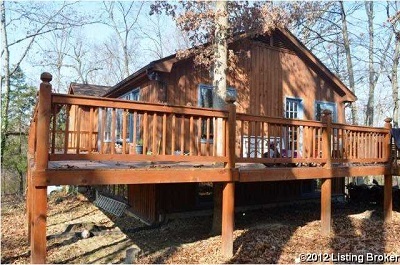 The house is pretty cool, kind of rustic looking with a gorgeous wrap around deck. New flooring (I’m hoping for hardwood, but at this point anything new would be better than what’s in there. It doesn’t look impressive, but if I listed out everything, you’d feel as overwhelmed as we do! Don’t worry, we’re going to do it over time, and really try to enjoy this house with our beautiful children. The potential here is amazing, and I see us here for a good 5 years (inside joke – we’ll be here longer than that – I’m just known for getting the moving ‘bug’ about every 5 years. I’ve been told I’m not allowed to move for a good 10 years though). Shouldn’t be a problem! I hope you’ll stick with me through some of the trials, tribulations, and triumphs that we’ll have over the next few years. If you’re a fellow Pinterest-er, you can follow me there too. I’ve pinned a ton of ideas for the new house, along with a plethora of other things too. Come on over! You can find me at http://www.pinterest.com/azapolya.